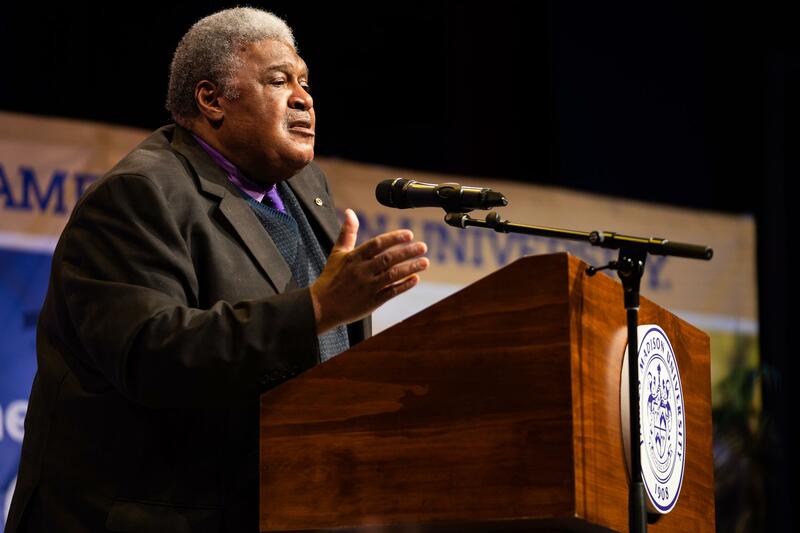 Former Virginia Supreme Court Justice John Charles Thomas spoke at James Madison University on Feb. 7. On Thursday afternoon [Feb. 7], retired Justice John Charles Thomas spoke at JMU, as part of its Madison Vision Series. The first black justice to sit on the Supreme Court of Virginia, Thomas shared bits of his remarkable life, recited original poetry and spoke on the importance of hope. WMRA's Andrew Jenner reports. Hope, Justice Thomas said, helped set him on his path from the housing projects of segregated Norfolk to the state’s highest court. And hope is what he came to impart at JMU. JUSTICE THOMAS: If you can summon hope from the friends that you know, and from leaders in your community who spur you on. And from people, sometimes strangers, who say, ‘You did a good job,’ you may be able to change everything. JUSTICE THOMAS: I had hope in my heart. I pushed where I saw a crack of light coming through the door. I urged other people to do the same thing. I read. I got my lessons. I tried to keep my nose clean. And I realized that everything in my life counted. As a retired justice, Thomas didn’t directly address the controversy surrounding Governor Ralph Northam and Attorney General Mark Herring, both of whom have admitted to dressing in blackface as young men. Given that backdrop, however, Thomas’s comments about the need to heal the state’s old racial wounds felt timely. JUSTICE THOMAS: And so I just wonder all the time about what we have lost by the hatred that we have had in our society, and I pray that our young people will get past it and understand better that we are all of one kind. We can at least teach our young people, our collegians, and anybody else who will listen, that there are ways to mend a broken society. And the way to do that, I think, is a message of hope.